As we head into Khmer New Year this April, take a moment to relax and get your head on straight – because as soon as the holidays are over the media will be heading into tumultuous territory with the upcoming commune elections on June 4. With the passage of the political parties law on March 1, opposition politicians and human rights activists fear it may only a matter of time before the Cambodia National Rescue Party is dissolved. International media and editors, at least, seem to be paying more attention to Cambodia and the national election in 2018 will continue to draw their interest. For better or worse, the interest of many news organisations is pegged on election cycles. 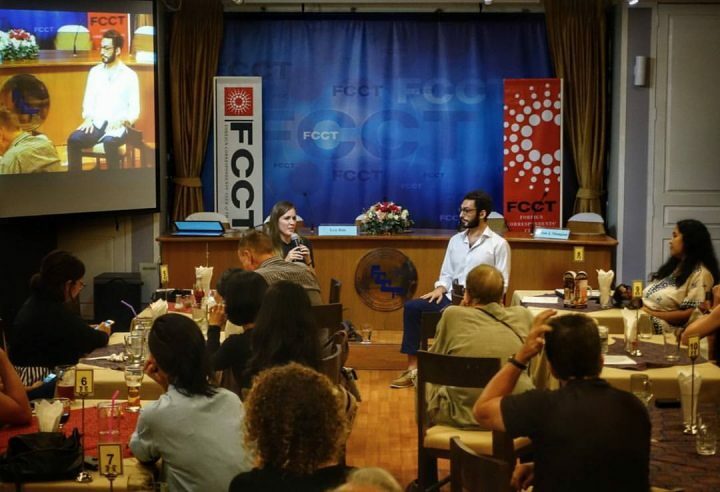 The turnout was decent – especially for a Friday night – and also encouraging as Cambodia is often eclipsed by other regional stories like Myanmar and Thailand. It was noteworthy to see how many people, though, still see Phnom Penh and Cambodia as the place it was in the 1990s – the rough and tumble setting of City of Ghosts. It made me think there is more we can do as journalists to convey all the changes that have taken place in the last two decades, although many things, like Hun Sen’s dominance are unfortunately still the same. Happy Khmer New Year and we look forward to seeing all of you at our next event.